I received this snack in my February Graze box. I suggest an iced tea with this selection, and have plenty on hand because it’s a spicy snack! You’ll want to refresh the palate! When I opened this tray, I had this Whisky & Cola Iced Tea from Southern Boy Teas chilling in my fridge! A nice way to cool the tongue after eating one of those jalapeño peanuts! Spicy! The peanuts have been seasoned with “jalapeño” flavoring (although the ingredient list says that it’s cayenne, I don’t see jalapeño in the complete ingredient list), and there are quite a few peanuts in this snack mix. The almonds have been seasoned with a “salsa” flavoring, and while there are far fewer almonds in this mix, there are enough here to amp up the zesty flavor of the mix. There are also sunflower seeds and pumpkin seed kernels in this mix, and they aren’t flavored except with a bit of soy sauce. They need a little salt. Yeah, I know soy sauce has a salty flavor to it, but, I would prefer a light salting over a soy sauce coating. Overall, I didn’t hate this this nutty snack mix. I don’t know that I enjoyed it enough to “like” it on my graze account. It’s tasty enough, but I felt as though it really could have used more salt. I’m not usually one who needs a lot of salt on things (unlike my husband who likes a little bit of food with his salt, it seems!) but this would have been better if it was a little saltier. Because of this, I chose to “trash” this snack. I didn’t hate it, but, I didn’t want to receive it again either. I like the spicy elements, but I wanted a little more contrast. Maybe some acid (how about lime seasoned pumpkin seeds? ), and definitely some more salt. Like a bold tortilla chip, these spicy falafel chips are a fun way to explore the exotic flavors of the East Mediterranean. Made with organic corn, beans, veggies and spices, they’re packed with flavor and also rich in protein, fiber and antioxidants. 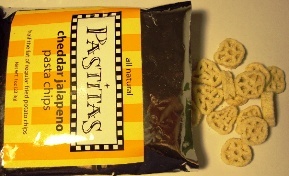 I received these falafel chips in my January Goodies Box. Because these chips are on the spicy side, I chose a white tea to enjoy with them – white tea has natural cooling properties and helps to calm the palate after eating something spicy! I found this Silver Needle tea from Enjoying Tea to be just the thing to sip while munching on these delicious chips! 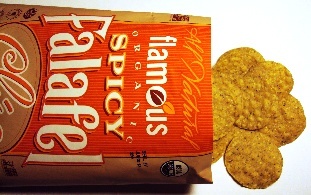 Having tried the “Original” variety of falafel chips from Flamous, I was pretty sure that I’d enjoy the spicy variety as well. But I had no idea that I’d enjoy them as much as I do! I think I may have just found a new favorite chip. These are unbelievably good. They have a nice, satisfying crunch and a similar texture to a tortilla chip. 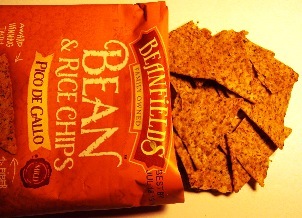 They are hearty like that … but they’re thinner than most tortilla chips – which I really like – and they are not greasy. I even did the white paper test … I opened the package and poured the chips out onto a piece of white paper to see how much residual grease the paper would absorb. Usually with most conventionally produced chips, there are grease spots, usually quite a bit! But with these there are only the tiniest grease spots. And more importantly, they don’t taste greasy either. They just taste delicious. This particular variety is SPICY, and as someone who favors spicy things, I like that too. They certainly don’t need a salsa dip … but you might want to consider a ranch dip or sour cream (or perhaps a cucumber yogurt dip might be delicious!) to help cool things off. Me … I like the spice. It warmed me up! Delicious! These are absolutely delicious. I prefer them over “traditional” chips like tortilla/corn chips or potato chips … I prefer the texture, the flavor and the fact that they are not greasy like those other products. These are just … really REALLY good. My February Love with Food Box is here! 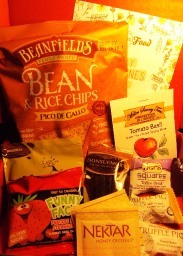 And I’m in love with the food that was sent in my February Love with Food box! This month’s theme is “Sweet and Spicy Valentine’s Day” and they sent me some amazing treats in my box! There you have it, a stunning list of goodies from Love with Food. This is the last month of my pre-purchased subscription that I got through my friend’s Groupon account, so, I’ve been considering whether or not I wanted to cancel this subscription … but, after receiving this box stuffed full of amazing goodies, I’ve decided I’m going to keep this subscription! Yay! Watch for reviews of each of these items. I’ll probably be reviewing the tea broth on the SororiTea Sisters site … so be sure to check that site out as well for that review! I received these nuts in my December Love with Food box, and they can be purchased on the Love with Food website. These almonds make a delightful tea-time snack! I enjoyed these nuts with a cup of Kyobancha from Tealet! I thought this was a perfect pairing – the natural nutty tones of the Kyobancha and it’s delicious roasty-toasty flavor complemented the almonds so nicely … allowing the natural goodness of the nut to shine through the sweetness of the honey, the warmth of the cinnamon and the touch of salt. The best part about these is the cinnamon, it gives the sweet, candied nut just enough extra interest to keep it … well, interesting. After a while, candied nuts – while delicious – end up tasting all the same, and it seems like this time of year almost every one of my tasting boxes has at least one type of candied or flavored nut in them. I don’t mind this, of course, I enjoy these offerings, and they make a somewhat healthier option versus all the sweet candies and cookies that are also sent in the tasting boxes. However, it’s nice when I open a pouch of candied almonds like this and find something just a little different about them … and with these, Nunes Farms added a touch of cinnamon (maybe a little bit more than just a touch!) to give them some warmth and spice without making them spicy. These aren’t an ordinary “spicy-sweet” kind of candied nut, or even just a sweet candied nut. They are really quite extraordinary! Well, first of all, the pouch was too small, because the almonds disappeared too quickly! (ha!) but, I loved the portion that I received. These are crunchy, a little salty, sweet from the honey (but not sticky!) and have just a little exciting twist with the cinnamon note. Really yummy! You’ll go nuts for these candied nuts! Bathed and baked in a bold blend of spices, they’re simultaneously sweet and savory. We’re not talking peanuts here; this jar is filled to the brim with plump almonds, cashews and pecans. I received a packet of these nuts in my November Goodies Box. These candied nuts make a wonderful tea time snack. They’re so flavorful and I love that gentle nudging of the spices in these nuts, so I wanted something that would bring out some of those warm spices even more. So I made a chai latte, and I found that this Masala Chai from Blue Lotus Chai made a perfect chai to go with these sweet, salty and warmly spiced nuts. Yummy! I’m totally loving these nuts! When I first opened the pouch, I was kind of “ho-hum … another batch of flavored nuts.” So I popped the first one in my mouth without paying much attention, and WOW! These taste amazing! First of all, I love that it’s a blend of mixed nuts: almonds, cashews and pecans. Then the nuts are candied in a sugar and spice combination that is a little bit sweet and a little bit savory. The result is a crunchy, toasty, salty, sweet and warmly spiced mix of nuts, and I’m going nuts for this! I love the contrast in flavors, I love the crunchy texture of the nuts together with the subtle chewy texture of the candied coating. These are so tasty and completely irresistible. Before I knew it, my package was empty! I want more! I only wish that the sample bag that I received in this month’s Goodie box wasn’t so small, because it was gone way too fast. I don’t think that this is going to be available in the stores, so I think I’m going to actually have to order more of this … and I definitely will be doing just that!